Belts for Kids - I Can Do It Myself! What do you get when you cross a willful, stubborn, potty-training toddler with baggy, saggy jeans? Truthfully, I don't want to know. But thanks to sister inventors Talia Bahr Goldfarb and Danielle Bahr Eason, kids now have a simple way to keep their pants above their knees. Their solution? Myself Belts. These innovative belts snap around the first belt loop (so it remains attached at all times). After sliding the belt through the rest of the loops, the child simply secures the end with the Velco closure. This design allows little ones to pull and tighten one-handed without the belt coming out of the loops, and without any tricky buckles to manage. 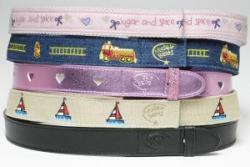 These belts promote independence and will have those "I'll-do-it-myselfers" bursting with self-esteem. Myself Belts are offered in adult sizes too, and would be helpful for those dealing with hand dexterity issues. In fact, these belts are perfect for anyone with cognitive or physical challenges. They are available for $12.50-$14.50 at the Myself Belts web site and at local retailers. Brilliant simple idea. My 4 year old son loves belts. But I don't feel comfortable sending him to school with one in case he really needs to go. He may not get his belt undone in time.